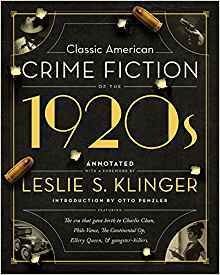 I was super-excited when news broke about Leslie Klinger’s latest project: an annotated edition of five key novels of the 1920s, four featuring iconic sleuths—Charlie Chan, Philo Vance, Ellery Queen, and Continental Op—and the final, Little Caesar, introducing a milestone gangster. When the Washington Independent Review of Books offered me the chance to review it, how could I resist? That review is up today—with a slight focus on Dashiell Hammett’s Red Harvest, one of my own favorite novels and one that I teach regularly at George Mason University. Klinger is one of the world’s leading authorities on the mystery genre, and this volume follows much of the approach and format of his landmark three-volume The New Annotated Sherlock Holmes, published just over a decade ago. Klinger’s foreword to this new collection offers a concise but comprehensive history of crime writing — both fiction and nonfiction — in the U.S., England, and beyond. He discusses the evolution of the genre from early true-crime writings, Gothic novels, and more through Poe’s pivotal role and into the 20th century. Along the way, he spotlights leading figures in the tradition — Arthur Conan Doyle, Katharine Green, Mary Roberts Rinehart, and others — and discusses the emphasis on puzzle mysteries as well as the intersections of crime writing and social documentary. For each of the works featured in the collection, Klinger offers mini essays mixing biography, critical appraisal, and publication history — and he puts his role as historian and critic above simply being an enthusiast for these titles.